Average Height	: 22" - 26"
Average Weight	: 60 - 65 lbs. The Belgian Malinois is a medium-sized, hard-working dog in the sheepdog family. Although it is known in the United States as Belgian Malinois, it is often classified as a variety of the Belgian Shepherd Dog. The Belgian Malinois was named after the Belgian city of Malines. While the Belgian Malinois is still rare in the USA, it is popular in Belgium, its country of origin. It is one of the four varieties of Belgian sheepdogs, the Belgian Malinois, Belgian Tervuren, Belgian Groenendael, and the less popular Belgian Laekenois, which all share a common foundation. In most countries and breed clubs all four dogs are considered the same breed with different varieties in coat types. Versatile and highly intelligent, all four varieties of the Belgian sheepdog excel at a variety of talents, including but not limited to, police work such as, narcotics and bomb detection, protection and Schutzhund, search and rescue, also obedience, agility, tracking, herding, sled and cart pulling and as a guide for the blind and assistant to the disabled. The Belgian Malinois was the first of the four sheepdogs to establish type. Until the other four were established in type they were called "Berger Belge a poil court autre que Malinois," which means "Belgian short-coated Sheepdog who is not the Malinois." Today all four sheepdogs are popular in Belgium, with the Laekenois and Malinois more often used as working type dogs, than the Belgian Groenendael and Tervuren but all types still making excellent workers. Malinois (fawn-mahogany, short coat with black mask). Tervuren (fawn-mahogany, long coat with black mask). Today's Malinois was developed by breeding a pair owned by a shepherd from Laeken named Adrien Janssens. In 1885, he purchased a pale, fawn rough-haired dog called Vos I, or Vos de Laeken from a cattle dealer in northern Belgium. Janssens used Vos I (which means fox in Flemish) to herd his flock and also bred him to a short-haired, brindle-brown dog named Lise (also known as Lise de Laeken or Liske de Laeken). After that mating, Vos I was bred to his daughters, establishing a line of very homogeneous dogs with grey rough-hairs and short-hairs, and fawn rough-hairs and short-hairs. Today, Vos I and Lise de Laeken are recognized as ancestors not only of the modern Belgian Shepherd Dogs as well as the Bouvier des Flandres and Dutch Shepherd Dogs. The Club du Chien de Berger Belge (Belgian Shepherd Dog Club) was formed in September 1891 to determine which of the many different types of dogs was representative only of the shepherd dogs developed in Belgium. In November of that same year, breeders and fanciers met on the outskirts of Brussels to examine shepherd dogs from that area. After much deliberation, veterinary professor Adolphe Reul and a panel of judges concluded that the native shepherd dog of that province were square, medium-size dogs with well-set triangular ears and very dark brown eyes and differed only in the texture, color, and length of hair. Subsequent examinations of dogs in other Belgian provinces resulted in similar findings. In 1892, Professor Reul wrote the first Belgian Shepherd Dog standard, which recognized three varieties: dogs with long coats, dogs with short coats, and dogs with rough coats. The Club du Chien de Berger Belge asked the Societe Royale Saint-Hubert (Belgium's equivalent to the AKC) for breed status, but was denied. By 1901, however, the Belgian Shepherd Dog was finally recognized as a breed. Breeders decided to give each of the different varieties of Belgian Shepherd Dogs their own names. The city of Malines had formed a club for the promotion of fawn shorthairs Belgian Shepherd dog in 1898. Louis Huyghebaert, an early breeder under the "ter Heide" kennel name, as well as a judge, author and the "godfather of the Malinois" (and the Bouvier), along with the Malines club had done much to help popularize these short-hairs, so the name "Malinois" came to be associated with the fawn shorthairs. In 1897, a year before the formation of the Malines club, Huyghebaert, suggested that since there weren't very many sheep left in Belgium, that the shepherd dogs should have field trials that showcased their intelligence, obedience and loyalty. 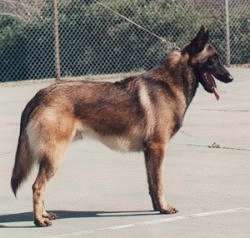 From this recommendation, dressage trials for the shepherd dogs were developed that tested a dog's ability to jump and perform other exercises. The first dressage trial, held on July 12, 1903 in Malines, was won by M. van Opdebeek and his Malinois, Cora van't Optewel. Belgian Shepherds were also used as guard dogs and draught dogs. They were the first dogs to be used by the Belgian police. Before World War II, international police dog trials became very popular in Europe, and Belgian dogs earned a number of prizes at the trials. When World War I broke out, many Belgian Shepherd Dogs were used by the military for a number of jobs including messenger dogs, Red Cross dogs, ambulance cart dogs and, according to some, light machine-gun cart dogs. During the 1920s and 1930s, several outstanding Malinois kennels were started in Belgium. During the first decades of the 20th century, Malinois and Groenendael were the most popular varieties of the Belgian Shepherd dogs to be exported to other countries. At that time, many were exported to the Netherlands, France, Switzerland, Canada, United States, Argentina and Brazil. In 1911, two Groenendaels and two Malinois were registered by the AKC as "German Sheepdogs." In 1913, the AKC changed the name to "Belgian Sheepdogs." The first dogs were imported by Josse Hanssens of Norwalk, Connecticut. He sold the two Malinois to L.I. De Winter of Guttenberg, New Jersey. De Winter produced several litters from the Malinois under his Winterview kennel name. After World War I, many American servicemen brought back Malinois and other Belgian Shepherd Dogs from Europe, and AKC registrations increased rapidly. The first Belgian Sheepdog Club of America was formed in 1924 and became a member club of the AKC soon after that. In 1924 and 1925, Walter Mucklow, a lawyer in Jacksonville, Florida, popularized the Malinois through AKC Gazette articles that he wrote. He also bred Malinois for a short time under the name of Castlehead Kennel. By the end of the 1920s, the Groenendael and Malinois Belgian Sheepdogs had risen in popularity to rank among the top five breeds. During the Great Depression, dog breeding was a luxury that most couldn't afford, and the first Belgian Sheepdog Club of America ceased to exist. During the 1930s, a few Malinois were registered with the AKC as imports trickled into the country. Even after the Great Depression, there were so few Malinois and interest in the breed had dropped so much that the AKC put them in the Miscellaneous Class at AKC shows in the 1930s and '40s. In 1949, a second Belgian Sheepdog Club of America was formed in Indiana. In that same year, John Cowley imported two Malinois and began his Netherlair kennel. He showed several of his dogs and several people became interested in them. By the 1960s, more people were breeding and showing Malinois. In March 1992, the American Belgian Malinois Club received AKC parent club status. o	Super intelligent and one of the most popular breeds trained in the Armed Forces. o	This breed has a great deal of energy and need a lot of exercise. o	Malinois are very intelligent and alert, athletic, sensitive and have great stamina. o	This is a breed that prefers to be active, engaged and given many tasks. o	A great breed for dog sports like agility, flyball & obedience, herding, tracking Schutzhund as well as police work. o	Great family dog ~ good with children. o	This breed is the smallest of the 4 Belgian Sheepdog breeds. o	Known also for their strong herding and protection instincts. o	Very people-oriented and want to be included in family activities. o	Belgian Malinois are intense, play-oriented and sensitive. Training should be fun, consistent, and positive. o	Not recommended for inexperienced dog owners. o	Not recommended if expected to spend long stretches alone ~ this dog needs to be kept busy. o	Great watchdog, confident and protective in any situation, reserved toward strangers. o	They protect their people and property with only as much force as is required. o	Shyness and aggression are not known in this breed. The Belgian Malinois is a very sensitive dog that makes a great family dog, but not for a beginner dog owner. They are loaded with energy and usually want to use this energy up with their master. It is important that you find activities for them to do so they don't find stuff to do on their own, stuff that may be negative. Because of their sensitive nature, many owners have stated that when they have a bad day, the dog just knows and responds accordingly. The Belgian Malinois makes a great family dog getting along well with all family members including children, especially if they grew up together. It is a good idea to socialize your Malinois with the public to avoid shyness and being unsocialized with strangers. They are very protective dogs and will protect their master and their home, but they are not aggressive. The Malinois will not be happy living in a kennel as some dogs do, although they do tolerate the cold weather well. He is double coated so he'll shed in the house, but is still happiest in the house. Because of their high intelligence and desire to please, they are easy to housebreak with consistent training. It is fine to leave them alone in the house while you work, but they will need to have instant exercise outdoors when you arrive home. Some Malinois have been known to be too aggressive or too shy. Keeping in mind that some of it can be hereditary, watch these traits, and if the dog doesn't outgrow them, seek advice from a professional trainer. A well-trained and well-adjusted Malinois will be loving, playful and loyal all of his or her life with proper attention, exercise and care. The Belgian Malinois is basically a pretty healthy dog. They are occasionally prone to hip dysplasia, which is a crippling genetic problem. The Belgian Malinois is a smooth short-coated dog that is easy to groom. They require a regular brushing with a firm bristle brush. Because they have a double coat, they will shed constantly, but they do their heavy shedding twice a year. Their coat has a waterproof quality that can be removed if the dog is bathed too often, so it is recommended to only bathe them when absolutely necessary. Belgian Malinois dogs need as much exercise as you can possibly give them. They are highly energetic dogs that need more than just an occasional walk around the block. They excel in almost every dog sport they participate in. They do not do well living in a small kennel. While they enjoy being indoors with you, they prefer to be playing outside. You will find that while playing games such as catching the ball, they never get tired. You will want to end the playtime long before they do. They should be on a leash while walking, however, as they may wish to chase other small animals, that they consider as prey. Part of this stems from their breeding and being part of the herding family of dogs. There is hardly any activity that the Malinois won't do if his master participates. Some trainers feel that the Malinois have a huge play drive and any activity is considered as playing to them. They love jogging along side their master. Many Malinois even participate in lure course, which is chasing an artificial lure around an obstacle course, following a certain line. Because of their loyalty, high-energy drive and intelligence, they participate and succeed in Schutzund training. The Belgian Malinois is a very active and highly intelligent dog that thrives on activity, exercise and playing. Put these three traits together and you have an excellent dog that excels in obedience, tracking, agility, flyball, lure course, herding and even Schutzund. Because of their high energy level, it is important to start their training at an early age to deter them from negative and destructive behavior brought out by boredom. The Malinois will never get tired of exercise and training, often considering this as part of his playtime. It is very important that you be firm with his training as if given an inch, they will take a foot. The training should begin at a very young age and good behavior should be rewarded with praise. Positive reinforcement works very well with this dog as all he wants to do is please you. Do not be verbally negative with the Malinois as they are very sensitive to negative tones and will not respond as well. Because of their high drive and intelligence, they are trained as guard dogs, police dogs and search and rescue dogs. When they are young pups, they should be enrolled in a puppy obedience kindergarten to get them used to what is expected of them. It is very important to be consistent with their training. They will not only expect it daily, but also come to look forward to it. This is also important to get them socialized around other dogs and especially other people. Often, the Malinois that isn't properly socialized as a pup will grow up to be either a shy dog or an aggressive dog. With the high energy level they possess, you do not want them to become aggressive or overly shy. Enrolling them in a training course as a pup will also allow professional trainers to observe him and help advise you as to what other training courses are available for you such as Schutzund, competitions.